This receiver was started in 2002 and used for my first ever QSO in March 2002. At that time it was just a collection of boards lying haphazardly on the workbench, but later I constructed the cabinet you see here, using aluminium angle, and aluminium sheet front panel, and 1/4-inch pine board. 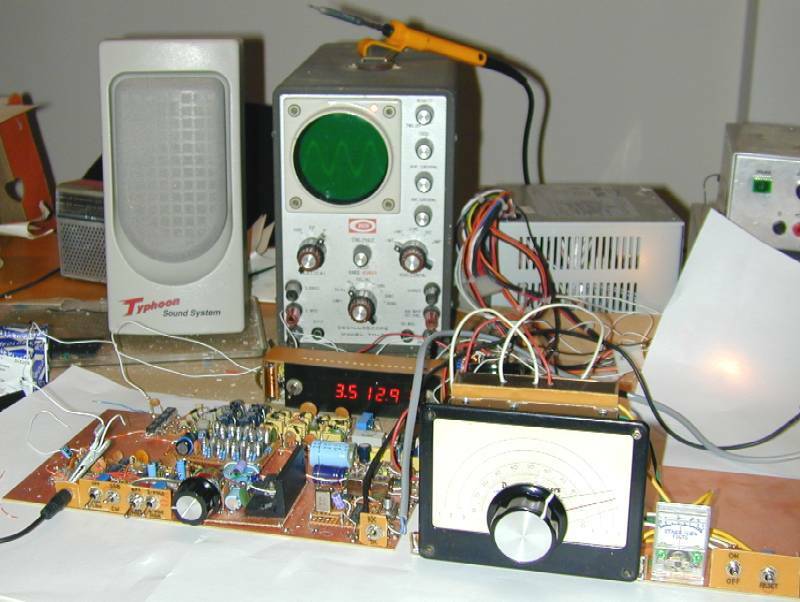 My original intention was to eventually develop this radio into a CW/SSB transceiver covering all UK amateur HF bands. However, there were many diversions along the way and I do not now consider it likely that I will do any further development on it. It remains an excellent 80m receiver, and has served well for many QSO's. This project is featured in Chapter 6 (HF Receivers) of the 8'th Edition RSGB Handbook, published in 2005. Click here to download my article, which probably contains a more detailed description than anything else you'll read on this page hereafter. Construction uses the "ugly" method and the receiver is currently unfinished. 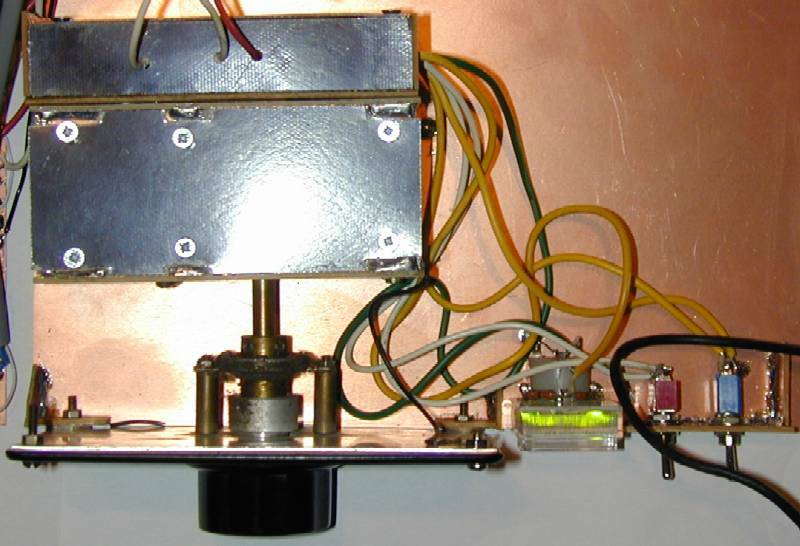 It uses an 80m bandpass filter from the GQRP webpage using two KANK3333. There is no RF amplifier, the filter directly feeds a FST3253 Tayloe switching mixer. Following the mixer are NE5534 op-amps with gains of 33dB. The VFO uses a 74HCT04 inverter chip, stabilised by a magnetically coupled Huff & Puff VFO from my Huff & Puff stabiliser page. I have replaced the internal oscillator of the 74HC4060 with the inverter gate oscillator which runs at 14 MHz (4 x freq, for the quadrature mixer). I have also now boxed the VFO and stabiliser using PCB board, and use a reduction dial (also my Father's). Frequency measurement uses my homebrewed frequency counter mounted at the top right of the front panel. Top left is my homebrewed Panel-mounting clock for convenience in those long ragchews. Then a lossless 8-column polyphase audio network, with varying resistor AND capacitor values according to a 1995 QEX article (see below). Components in the network are matched to 0.1%. Next are a set of unity gain OP27 op-amps. One output of the network feeds four NE5534's as low pass filters (8 poles Butterworth @ 3KHz) and two NE5534 high pass filters (4 poles Butterworth @ 250Hz). 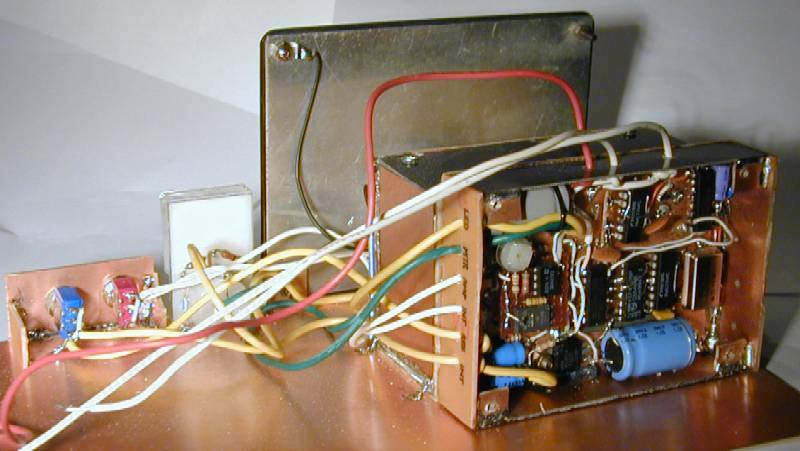 For CW I can switch in my CW filter, and/or a 2-pole Butterworth op-amp filter as in the ARRL handbook. There is another NE5534 as a preamp giving 20dB gain, then a TDA2002 audio amp driving a 4-ohm 30W computer loudspeaker. I have been unable to measure the opposite sideband to the limits of my measurement (just 40dB at the moment). At night here in the UK and with just a few feet of wire strung into the next room, I have listened in on an American 75m net: all participants were audible (armchair copy). (Below left), the bandpass filter and tayloe detector. The Tayloe detector is clocked via a synchronous divide-by-4 counter (74HCT163). As yet I have made no attempt to adjust the 1K balancing resistors, since I have inadequate measurement equipment to detect the opposite sideband (my limit is -40dB and the opposite sideband is below this). The polyphase network (below middle) is designed according to an article in QEX November 1995 (see below). The resistor and capacitor values for the columns are shown at the top of each columns. I used expensive 0.1% resistors from RS Components, and matched the capacitors in each column to within 0.1% using a 555 oscillator circuit and frequency counter, and adding parallel capacitance from the junk box until the oscillation frequency matched to the required degree. The chart (below right) shows the theoretical opposite sideband suppression with the component values shown. Tetsuo Yoshida JA1KO explained how to design a lossless polyphase network in the November 1995 issue of QEX, which can be downloaded below. Reproduced by permission of the ARRL. The oscillator uses a 74ACT04 Hex-inverter IC and proves highly reliable, as well as conveniently giving a digital output without messing around with squaring up a sinewave signal. The oscillator frequency is about 14MHz (4x required reception frequency). The reduction drive and dial is by Jackson Brothers reduction drive. It belonged to my Father. The meter shows the voltage at the integrator output and is usually somewhere in the middle. The On/Off switch isn't the power, it's whether the Huff & Puff stabiliser loop is closed or not. The reset button puts the integrator back at mid point. The variable capacitor is boxed with the oscillator circuit, bolted to a separate box containing the stabiliser. The boxes are soldered from single sided PCB material, with some sides screwed on for access. All the cables to the meter and switches are screened. Details of the Huff Puff stabilised VFO on my Huff & Puff page. Inside the oscillator compartment, you can see the relay coil which provides the stabiliser feedback to the coil by varying the magnetic field the toroid sits in. 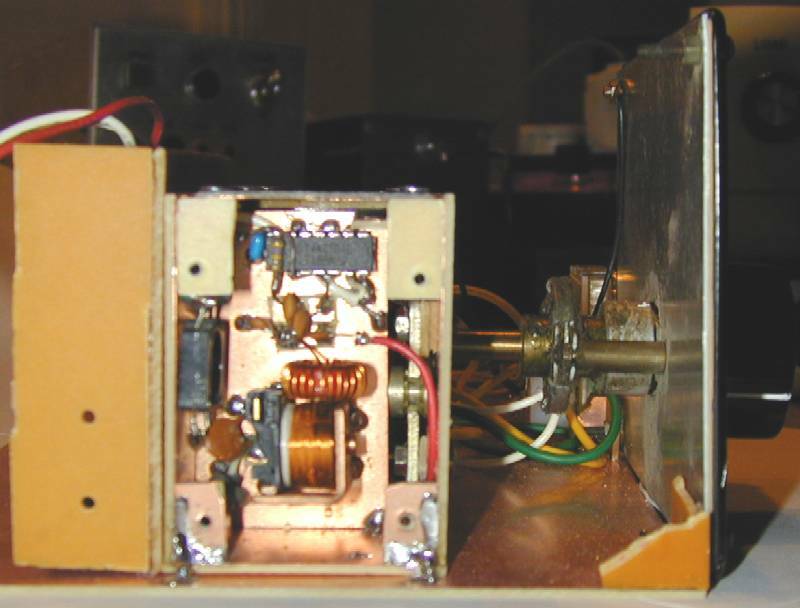 A couple of the older photos show the G0UPL radio station before the receiver was boxed. 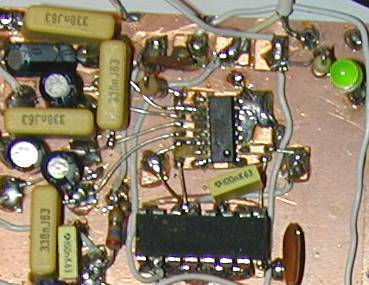 The close-up of the mixer section of the board shows how to surface mount a FST3253 chip (centre of photo). I sawed off a small piece of single-sided PCB material and cut tracks in it with a sharp craft knife. Soldering the FST3253 must be done with a steady hand. The small board is glued to the main board and connections made to the larger tracks formed on the board. Bottom Left: Audio filtering. Switches control which filters are used. Speaker socket at left. Bottom Centre: Audio power amp, and volume control. I have made a few response measurements of the receiver. With my current setup I can only measure down to -40dB. I am unable to measure the opposite sideband suppression which is below this, even with NO balancing adjustment. The CW filter response shown here is the phasing CW filter. 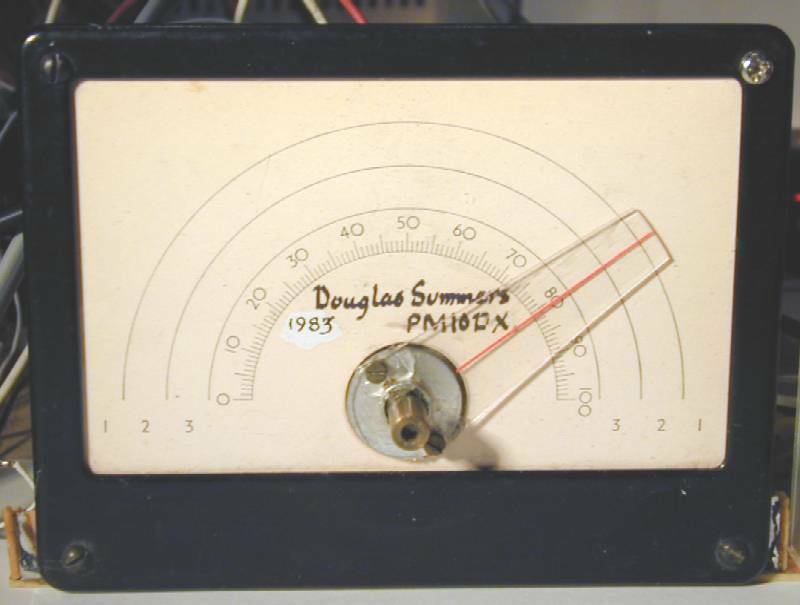 I now also have the option of a 2-stage butterworth filter as described in the ARRL handbook. It is less narrow than the phasing CW filter. The SSB response is too narrow and I need to redesign these filters. Nevertheless it is quite comfortable to listen to SSB. The polyphase network measurements indicate the validity of the method described in the QEX article for acheiving a lossless network. NOTE: The Tayloe detector response is shown out to 100KHz while audio reponses are shown to a scale of 10KHz. 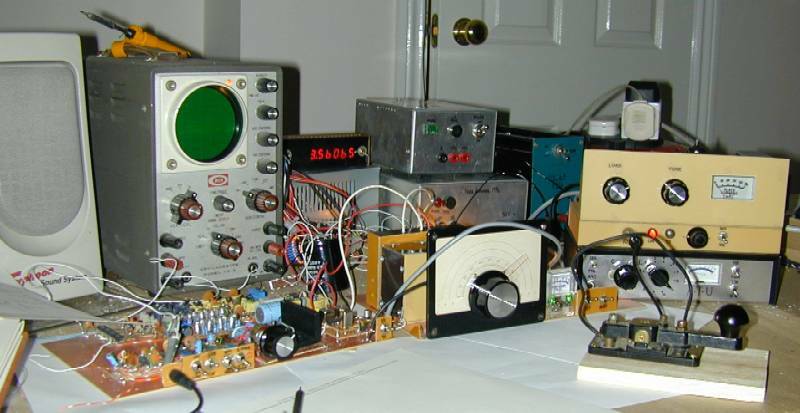 The HF receiver was later made operational on 40m in addition to the original 80m. This uses the same 14MHz VFO divided by 2 rather than 4. Because this results in quadrature with imperfect phase (due to non 50% duty of the 14MHz oscillator output), the opposite sideband suppression on 40m isn't very good. Here are pictures of the most recent work on the HF receiver. These two "rack-mounted" shielded boards are rebuilds of the bandpass filter and Tayloe detector/polyphase sections of the circuit. They are made from unetched PCB and will also have lids, forming complete screened boxes. Left: Bandpass filter board. Row of 9 relays along the bottom to switch the 9 HF bands. 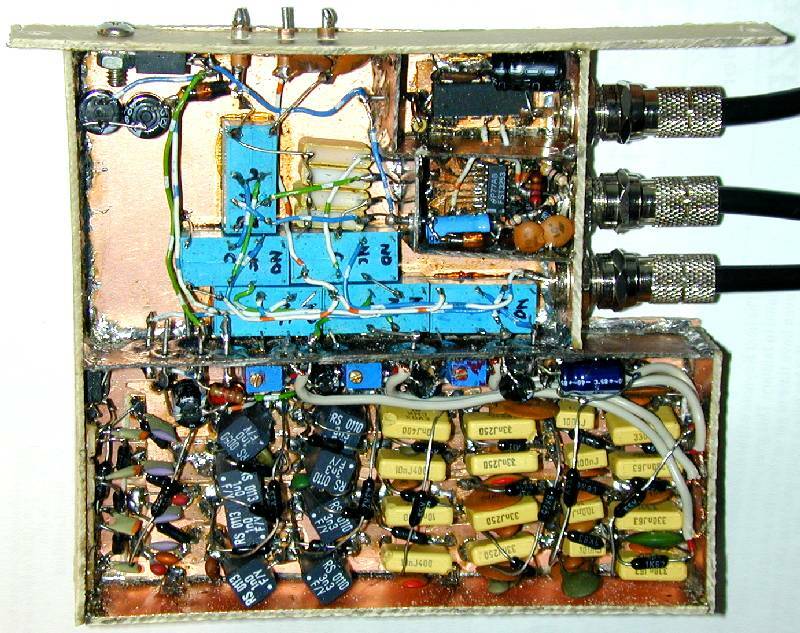 Two relays at top right of the board, with 2 bandpass filter sections are all that are currently installed, to cover 80m and 40m bands. You can also see temporarly installation of the crystal test oscillator (3.515MHz). Centre: Polyphase Network and Tayloe Detector board. Signal connections are RF, AF and VFO. 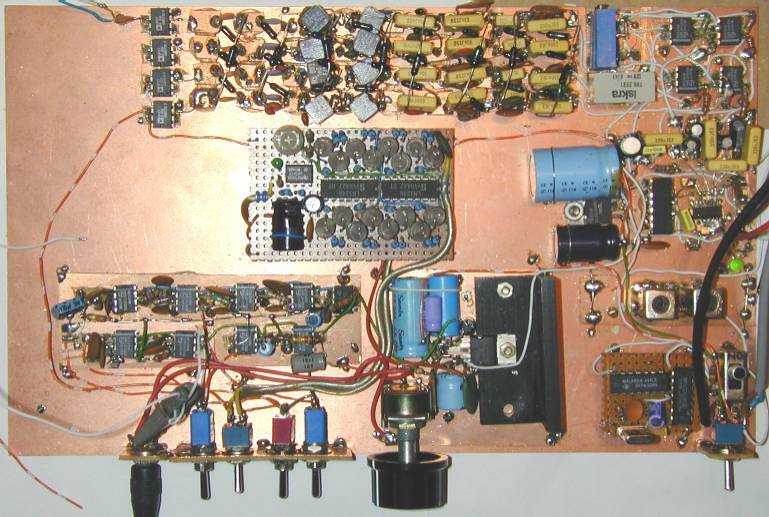 The board is intended to be a SSB detector / SSB exciter, i.e. be bi-directional. The RF and AF ports are inputs and outputs depending on the configuration. So far the SSB exciter configuration hasn't been tested. The 6 miniature DPDT relays in blue reconfigure the circuit for transmit or recieve, and USB/LSB. 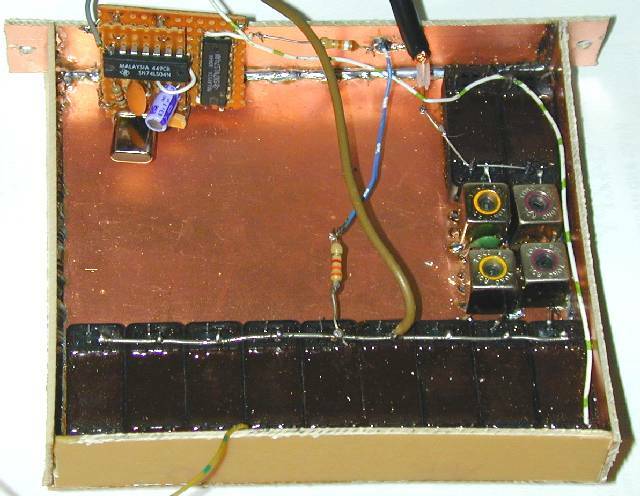 Right: Outside view of the Polyphase Network and Tayloe Detector board. Signal connections are F-type satellite coaxial sockets. DC connections are via feedthrough capacitors and supply 12V, and the TX/RX and USB/LSB switching signals. http://antennoloog.nl/polyphase-networks/: An excellent information resource by W.J. (Pim) Niessen PA2PIM, including spreadsheet for simulating sideband suppression with chosen component values in the polyphase network. http://rubidium.dyndns.org/~magnus/synths/friends/gingell/: Original PhD thesis on polyphase networks by Mike Gingell. (Thanks to Magnus Danielson for providing this information).